When you drive a luxury sedan with all the best protections, you’ll get more enjoyment out of every drive! The 2019 Acura RLX safety features make this sedan a great choice for your Naperville and Bolingbrook drives. Once you’ve seen what it’s bringing to the table, you’ll find it impossible to disagree! Take a closer look at the Acura RLX driver-assistance and safety technologies before getting behind the wheel at McGrath Acura of Westmont. Collision Mitigation Braking System™ (CMBS™): The Acura RLX uses front-mounted cameras and sensors to monitor the road for obstacles and pedestrians ahead. A Forward Collision Warning (FCW) sends out an audiovisual alert if you’re at risk of crashing, and if necessary, the CMBS™ slows and stops your car automatically. 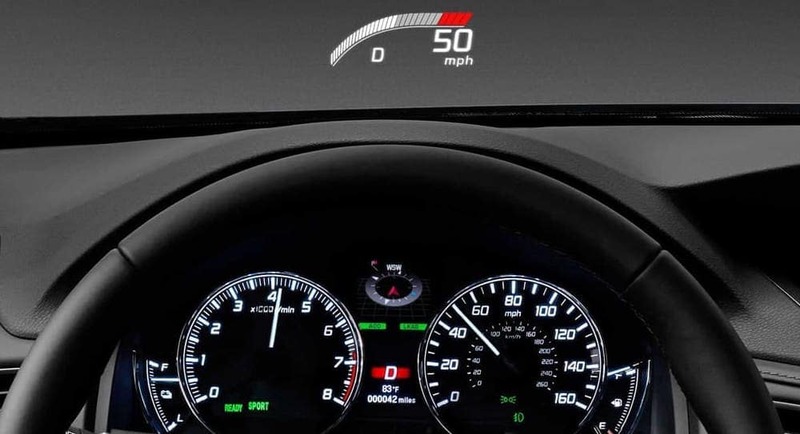 Adaptive Cruise Control (ACC) with Low-Speed Follow: Set your preferred speed and follow distance and let your Adaptive Cruise Control take the stress out of your commute. When you encounter another car in your lane, ACC will slow your rate of travel and keep you following at a safe distance, until the lane opens up again. Lane Keeping Assist System (LKAS): The Lane Keeping Assist System works with Lane Departure Warning (LDW) to keep you safely centered in your lane of choice. The LDW will alert you If you start to move over a lane line without signaling, and the LKAS will gently guide you down the highways near Elmhurst. Road Departure Mitigation System: with Road Departure Mitigation, you’ll be protected against unintended exits. This system tracks the righthand edge of the road and gently directs you back toward the center of your lane if it finds you’re at risk of going over. Traffic Jam Assist: Traffic jams usually demand a constant back and forth between the brake and the gas pedal, but when you’re behind the wheel of the Acura RLX, you’ll be able to sit back and relax. Traffic Jam Assist detects the vehicle ahead of you and keeps you following at a safe distance, starting and stopping as necessary. On models equipped with the Advance Package, your AcuraWatch safety features and alerts will be paired with a Head-Up Warning System designed to maximize their utility. Most Acura RLX safety technologies are standard on all trims, but models with the Advance Package feature a Surround View Camera System, front and rear Parking Sensors. Front Wheel Drive is standard with the Technology Package, while Sport Hybrid Super-Handling All-Wheel Drive™ is standard with the Advance Package. The 2019 Acura RLX has received a 5-star overall safety score* from the experts at the National Highway Traffic Administration. This perfect overall score reflects the fact that the RLX has earned 5-star crash test ratings in every single category evaluated by the NHTSA. The same can only be said of a handful of RLX competitors. Test Drive an Acura RLX for Sale at McGrath Acura of Westmont! Ready to experience a luxury sedan with more to offer? Visit McGrath Acura of Westmont near Naperville to experience the 2019 Acura RLX safety features first hand. Find a new Acura RLX that has everything you need today, and you could be driving home to Downers Grove or Chicago tomorrow! Don’t wait to schedule your test drive.